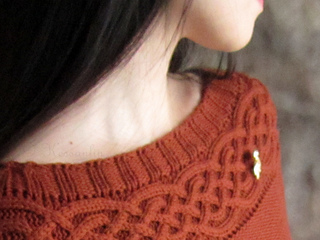 A seamless top-down tunic with a Celtic Cable yoke. 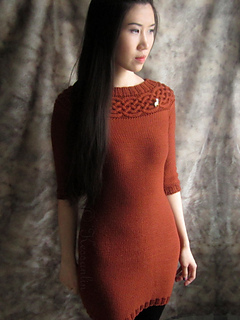 Celtic Hill is a tunic featuring an elegant “Sabrina” neckline, which is a type of Boat neckline that curves slightly lower. The clever shaping in this design, along with a pinch of negative ease, enhances the womanly curves but still remain comfortable. 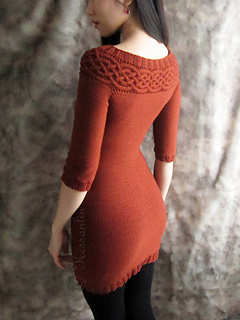 Easily modified to be a dress or pullover. 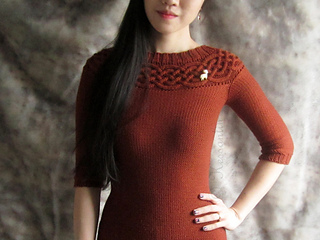 Gauge: 20.5 sts and 31 rows over 4”(10 cm) in St st, on US7(4.5mm) needles, after blocking. 19 sts/27 rows over 4”(10cm) in St st, on US8 (5mm) needles, after blocking. 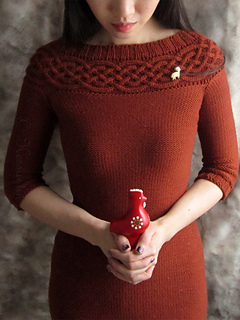 Techniques: Knit, Purl, Yarn over, K2T, P2T, SSK, Lifted Increase, Cabling, knitting in the round, knitting flat, picking up stitches, chart-reading and grafting (picture tutorial provided in a separate file). 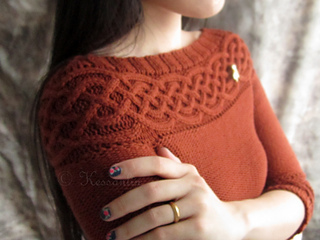 This pattern had been test-knitted.